The FreeMax Mesh Pro Sub Ohm Tank is a stainless steel, glass and resin constructed vape tank. It is 510 threaded and has a gold plated 510 contact pin. 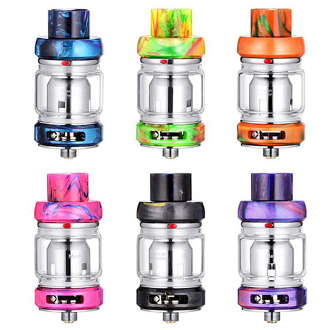 This tank has a 5ml capacity with the capability to be upgraded to a 6ml tank by replacing the standard glass tube with a replacement bubble glass tube. The FreeMax Mesh Pro has a retractable top fill design with a vent hole design. This is for accelerated filling and added leak resistance. Another great feature is the adjustable airflow control valve with dual airflow slots found at the bottom of the tank. Also, this tank utilizes Mesh Pro Kanthal Atomizer heads for variable wattage. Included in the package are two different coil heads designed for several different wattages.